A manager that lays out fields in a single, vertical column. A vertical field manager lays out fields top to bottom in a single column. You can build this manager with Manager.HORIZONTAL_SCROLL to accommodate fields wider than the manager's visible frame; you can build this manager with Manager.VERTICAL_SCROLL to accommodate collections of fields taller than the manager's visible frame. Constructs a new vertical field manager. Constructs a new vertical field manager with provided style. Retrieves the manager's preferred height (in pixels). Retrieves the manager's preferred width (in pixels). style - Styles(s) for this manager (can be Manager.VERTICAL_SCROLL and/or Manager.HORIZONTAL_SCROLL). This method returns the height (in pixels) required to lay out the manager�s contents. 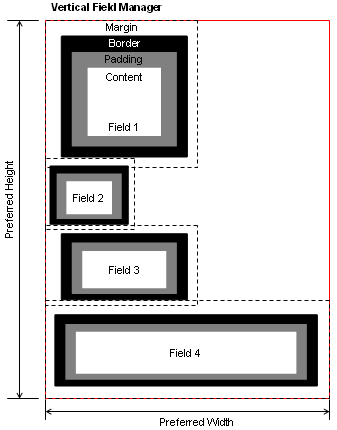 It includes the preferred heights for the controlled fields, as well as spacing between these fields. Spacing between neighboring fields is defined by the largest of each field�s margins. Vertical space preferred by the manager. This method returns the width (in pixels) required to lay out the manager�s contents. The contents width is defined by the widest of controlled fields and its margins. Horizontal space preferred by the manager. VerticalFieldManager will move focus out of the manager in the event of AXIS_HORIZONTAL movement. maxWidth - Width available for layout. maxHeight - Height available for layout. Given a point in coordinates to this manager's extent, this method returns the index of the controlled field under that point. This method performs a binary search.